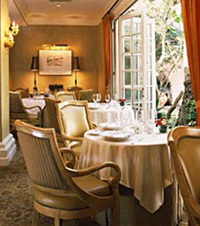 Welcome to the enchanted world of The Restaurant at the Hotel Bel Air. Not far from the bustling pace and invasive clamor of modern Los Angeles, lies a culinary oasis surrounded by the dramatic estates of the elite and famous. Everything about this gastronomic Shangri-La suggests enchantment and elegance. One enters by crossing a bridge over a lake inhabited with graceful white swans. This beautifully designed bridge adds mystery and mystique to the milieu that inevitably leads to several acres of luxuriously adorned grounds accented with the scents and sights of colorful and enchanting flowers. The entire setting promises a memorable dining experience. 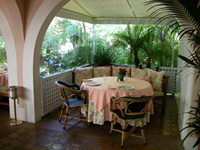 The atmosphere of The Restaurant is exquisite and welcoming, from the crisply designed tableware, linens and Italian furnishings to a comfortable terrace with an outdoor fireplace. With the moderate California climate, one can comfortably dine on the terrace with a roaring fire, a beautiful view of the flowers, and occasionally a swan or two. 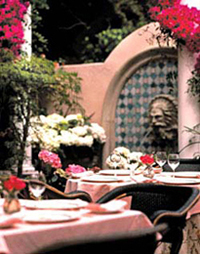 The restaurant combines old world Mediterranean elegance with the avant-garde artistry that is uniquely Californian both in style and choices of tantalizing menu selections. One can sense the allure of the Hollywood of yesteryear in the elegance and grandeur of this magnificent restaurant, which is but a small piece of the Hotel Bel Air that often housed the rich and famous. It is not out of the ordinary to spot a star or two while one is dining here, which adds to the ambience of the whole experience. In close proximity to the restaurant is a piano bar with its’ lush furnishings and cozy fireplace that attracts both locals and tourists searching for that perfect martini and some camaraderie. The menu is eclectic in that there are gourmet delights for even the most discriminating palette. Examples of succulent favorites of mine for lunch include a warm Maine lobster, scallop, and shrimp salad, or a Forest mushroom and truffle ravioli. Other more traditional fare for lunch include a traditional Caesar Salad with grilled shrimp or chicken and a Smoked salmon Salad. There is an old favorite for those who are in the mood for a juicy burger called the Nancy Reagan Burger, appropriately named after the former First Lady who has been a frequent visitor for years.“Inspired starters” for dinner as they are so named, include Smoked oyster asparagus soup or farm raised Beluga caviar. A good choice for dinner is the Kobe Chateaubriand for two that lingers pleasantly in one’s memory for quite some time. For those who care to sample several items and share with others at the their table there is a Tasting Menu served at dinner only which includes such exotic delicacies as Coquille St. Jacques and Braised endive, Veal Noisette Rossini, Goat cheese stuffed with truffles, and Fleur de Chocolate. With suggested wines this offering is priced at $135. While salads and starters are moderately priced, dinner entrees can range from $32-$78. The Sunday brunch, not to be missed is a gastronomic parade of elegance that allows a guest to choose one item from each category of appetizers, main courses, and desserts for $58 per person or $65 per person with champagne. One of the most tantalizing selections on this menu is a very special Maple-bourbon Crème Brulee French Toast with Applewood Smoked Bacon. The visual presentation of all the selections I have seen and tasted is unmatched by few restaurants in the Los Angeles area. One also cannot ignore the impeccable service at the Hotel Bel Air. Waiters who are knowledgeable, friendly and attentive are rare commodities, but this is certainly the case here, where you every need is anticipated, often before you realize the need yourself. During one visit, our waiter seemed almost glowingly giddy, as he proudly proclaimed that there were over 10,000 bottles of fine wine in the restaurant’s wine cellar. Copyright © 2010 LAURA SCHULTZ NOW.COM. All rights reserved.